In this area of the Apparel Search fashion brand directory, you will find Men's fashion brands from leading apparel companies and fashion designers. On this particular page, you will find information regarding Men's clothing with the Tommy Bahama brand. 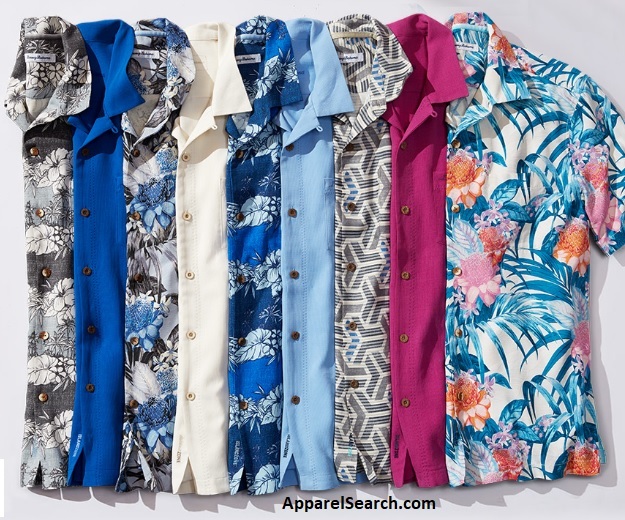 You are welcome to utilize this section of our clothing guide to review Tommy Bahama news, Tommy Bahama blog posts, Tommy Bahama photos, and more. Please understand that you may run into a few photos or a tad of information that does not actually pertain to the Men's Tommy Bahama fashion brand. Unfortunately, no search technology is absolutely perfect. We will continue to do our best to bring you as much information about the Men's Tommy Bahama fashion collection as possible. Tommy Bahama is a lifestyle brand. The lifestyle is "relaxed". It takes you to a place without deadlines or demands. The idea is to relax in style and breathe freely with simple pleasures. It's called living the island life. Think about vacation when you think about this apparel brand. The ounders started a brand based on the refined, unhurried attitude of coastal life. Tommy Bahama soon became synonymous with laid-back style and the concept of living the Island Life. What started as a causal, upscale menswear collection quickly evolved into a unique luxury lifestyle brand. Everything that bears the Tommy Bahama name is created with an unwavering eye towards quality. Learn more about the men's Tommy Bahama brand clothing. Enjoy the finer things with soft, detailed, and dapper fabrics. Find jackets, pants, shorts, swimwear, denim, belts, socks, shirts, and more. If you have changed your mind and do not wish to research the brand Tommy Bahama, you can use the search engine on this page to find another clothing label that may be of more interest. Apparel Search is a leading guide to fashion, style, clothing, glam and all things relevant to apparel. We hope that you find this Tommy Bahama page to be helpful. The casual clothes that you are wearing today is most certainly in style.